Whether the fish is marketed fresh at 1,5 – 2,5 kg, or even larger specimens are produced for smoking purposes, or live fish for stocking of fishing ponds etc., large, well pigmented rainbow trout produced in freshwater is a valuable cost effective supplement to the more traditional freshwater product: pan size rainbow trout. 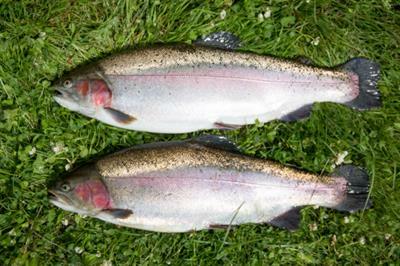 Depending on general farming conditions and temperature range in particular, the production of large rainbow trout in freshwater may require more than two winter periods. To reduce the risk of pre-slaughter maturation, AquaSearch ova is offering all female eggs from 4 or 5 year old maturing brood stock. The production of large, well-pigmented rainbow trout! Becoming more and more a valuable cost effective supplement to the traditional pan-size, whatever the fish is to be used for smoking purposes or for stocking in fish ponds. Growing the large trout requires more than 2 winters without the setback of maturation. The AquaSearch LATE is based on offspring from 4 or 5 year old first time maturing broodstock. Along with the family based selection, AquaSearch ova ApS is also carrying out an implementation of genetic and genomic selection. This type of selection is more precise and allows for selection on hidden traits such as resistanceagainst specific diseases. No reviews were found for AquaSearch - Late for Pigmented Rainbow Trout. Be the first to review!